On 24 January, the one-and-a-half year long treason trial of ex-President Viktor Yanukovych finally ended. The fugitive ex-head of state was charged with high treason, encroachment on the territorial integrity and inviolability of Ukraine, and complicity in Russia’s aggressive warfare. Since Yanukovych has been hiding in Russia since early spring of 2014, he was tried in absentia. The court summoned Yanukovych several times, but he ignored the requests. Later, the former president planned to give evidence via video connection from Russia but it failed. Later, Yanukovych was going to remotely deliver his final statement but the hearings were postponed as his attorney stated that his client was taken to a hospital. Later Yanukovych didn’t take part in his trial. In total, more than 100 witnesses were interviewed for the case, including the former Russian MP Denis Voronenkov, who was shot dead in Kyiv in March 2017. The courtroom testimonies of Ukrainian officials shed light on the unknown and disregarded details of Russia’s occupation of Crimea. Here’s what we learned from the trial. The prosecutors asked the court to sentence Yanukovych to 15 years imprisonment, the maximal term prescribed for high treason under Article 111 of the Criminal Code of Ukraine. Judges of the Obolon District Court in Kyiv found Yanukovych guilty of two charges, high treason and complicity in aggressive war, sentencing him in absentia to 13 years in prison in the first charge and 12 in the second. However, the court found Yanukovych not guilty in separatism, since when asking Russia for help he didn’t realize the consequences his actions later triggered. The Ukrainian legal system doesn’t allow imposing the terms of imprisonment imposed on the same person at the same time consecutively. Instead, absorption of the less severe punishment by the more severe one takes place. Thus, the final sentence is 13 years in prison. A number of direct participants of the winter-spring 2014 developments testified in court during the legal proceedings. And their first-hand testimonies detailed the disastrous situation Ukraine faced and had to deal with following Yanukovych’s rule, his flight, and subsequent aggression by the Russian Federation. After Yanukovych won the 2010 presidential elections, he started destroying the Ukrainian military capabilities. Read also: Who destroyed the Ukrainian Army? Mykhailo Koval, the acting defense minister from late March until early July 2014, testified that Yanukovych as commander-in-chief of the Armed Forces of Ukraine (AFU) had to order the General Staff to draw up defensive operations plans. Instead, the then president degraded the combat readiness of the army. No plans and tasks existed, many military units were disbanded, especially in the strategically important regions – the East, Crimea, and Besarabia, as Mr. Koval referred to the historical South-Western region bordering Moldova. According to the officer, the army’s logistic, mobilization, food and supply systems were destroyed. No reservist trainings were held in 2010-2014. At the moment of the beginning of the Russian aggression, “The Army didn’t exist as such,” Mr. Koval said. Acting defense minister (February-March 2014) Ihor Teniukh told the court that the “personnel clean-up” started in the Navy when Yanukovych came to power. Turchynov told that 71% of the Ukrainian soldiers based in Crimea defected to Russia amid the annexation of Crimea. A major element of the indictment on charges of state treason at the trial was the letter of Yanukovych in which he asked President of Russia Vladimir Putin to use Russian armed forces on Ukrainian territory. “I call on the president of Russia, Putin, asking him to use the armed forces of the Russian Federation to reinstate legality, peace, law and order, stability and protecting the population of Ukraine,” reads the letter dated 1 March 2014 with Yanukovych’s signature. On 3 March 2014 amid the unfolding Russian occupation of Ukraine’s Crimea at an emergency meeting on the situation in Ukraine held the United Nations Security Council, Russian envoy Vitaly Churkin cited a document entitled “Statement,” part of a letter purportedly from Yanukovych to Putin. The one-page document was registered as a document of the UN Security Council on 3 March 2014 as an annex to a letter by the Russian then-envoy. This made the statement evidence of high treason of Yanukovych. In 2017, Moscow understood that Yanukovych’s letter didn’t justify its military aggression against Ukraine and came out with an extraordinary claim that the “statement” signed by Yanukovych had never been received. The nearly full text of the letter written in Ukrainian emerged in March 2018. It didn’t include only one page – the Russian-language version of the statement. However, it mentioned it among the appendices together with the Ukrainian original of the statement. 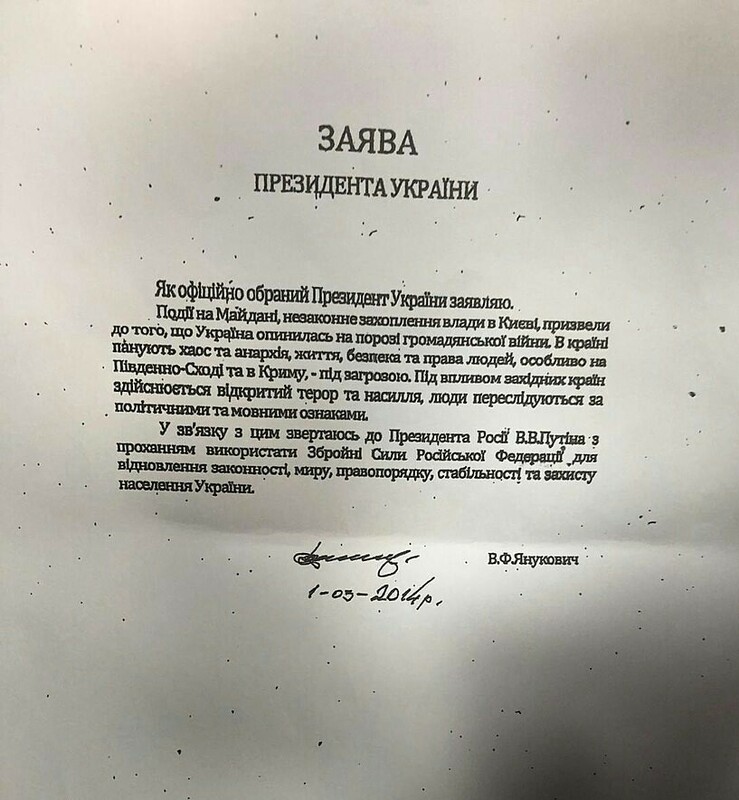 The letter’s body is also dated 1 March, but it contains an additional subline containing the city where Yanukovych had signed it. And the city was Rostov-on-Don, Russia. The letter cites the 1997 Russia-Ukraine friendship treaty as premises to ask Russia for invasion in the Ukrainian territory. It asks Putin to hold consultations on four questions, including “temporary performance of separate peacekeeping functions including police ones” by the Russian military formations stationed in Crimea. During his press conference in Rostov-on-Don on 28 February 2014, “I am not going to seek military support, Ukraine should stay united and undivided,” was Yanukovych’s reply to the question whether he was going to ask Russia to deploy troops to Crimea. He said it a day before the date specified in his letter to Putin. So the fugitive president either didn’t know what he would sign on the next day or just lied about his intentions. A month later in his interview with NTV and AP, Yanukovych admitted that his statement presented at a UNSC meeting was genuine and regretted his plea to deploy Russian troops to Crimea. “I was wrong, I overreacted,” he said. Yanukovych called Russia’s annexation of Crimea “a tragedy” and blamed the post-Maidan government for Ukraine’s loss of Crimea. As Ukrainian diplomats testified in the legal proceeding, Yanukovych’s letter was the second attempt by Russia to justify its aggressive actions in Crimea. On 1 March 2014 at the second closed meeting of the UN Security Council on Ukraine, the Russian envoy Churkin cited an appeal of Sergey Aksyonov urging Putin to deploy the Russian troops in Crimea. Aksyonov was a deputy of the Crimean Supreme Council, or local parliament, whom the local legislators reportedly appointed a prime minister of the Crimean Republic on 27 February 2014. However, at that moment, the local parliament building was already seized and controlled by the “little green men” who later turned out to be the regular active-duty soldiers of the Russian Federation. The UNSC meeting was convened following the unanimous decision of the Federation Council, or Russia’s upper house, authorizing President Putin to use Russian troops in Ukraine. Then, the troops were already mass deployed and operating for more than a week. The then Interim President of Ukraine Oleksandr Turchynov said that: “We consider the behavior of the Russian Federation to be direct aggression against the sovereignty of Ukraine” and the Ukrainian envoy delivered this position in his statement at the 1 March UNSC meeting. “The Russian ambassador voiced the appeal of Aksyonov to Putin, and said that he knew that Yanukovych supported Aksyonov’s appeal, but didn’t provide any evidence,” testified Yurii Serheiev, then Ukrainian Ambassador of Ukraine to the UN. The Russian representative displayed Aksyonov’s purported statement to show that they were asked for support. “But all speakers slammed Russia’s position and spoke about flimsy pretexts. Aksyonov isn’t a figure who can invite the military. Only the [Ukrainian parliament] Verkhovna Rada can do it,” he said. Then Ukrainian Deputy Foreign Minister Serhii Kyslytsia testified that Russian envoy Churkin was bewildered at the 28 February and 1 March meetings and couldn’t explain what was happening in Crimea. “And later on 3 [March] after Putin received the permission to use troops in the Ukrainian territory, experienced diplomat Churkin had to explain what had happened. And at that meeting Churkin stated that he had a copy of the statement by the Ukrainian president [Yanukovych], who addresses Russia asking to use its military forces,” Mr. Kyslytsia told. Then Minister of Foreign Affairs Andrii Deshchytsia gave a testimony that starting from the end of February 2014 he tried to contact Russian FM Sergey Lavrov several times, but received the same answer that Russia doesn’t recognize the Ukrainian government and Deshchytsia himself as a minister. “Russia ignored any attempts [to establish relations] as on the level of the Verkhovna Rada, as on the ministry level,” he said. Andrii Plakhotniuk, who was a deputy director of the Ukrainian foreign ministry’s political department when the Russian invasion unfolded, testified that his ministry sent protest notes to Russia almost every day. “At the end of February  we proposed consultations. To my recollection, Russia didn’t even agree at once to telephone conversations. And the notes that required urgent reaction [remained unanswered],” according to the diplomat. Then acting defense minister Teniukh told in court that he talked to his Russian counterpart, Sergey Shoygu, who assured that no Russian military was involved in the Crimean events. In his testimony, then acting president Oleksandr Turchynov recalled that the head of Russia’s State Duma or lower chamber Sergey Naryshkin called him during the urgent meeting of the National Security and Defense Council. testified Mr. Turchynov, adding that Naryshkin started threatening that if Russian-speaking people would die, Russia would commit the actual invasion. Turchynov pointed out that Russia violates international agreements, but Naryshkin countered that there would be a judicial and political rationale for deploying troops. Later, Yanukovych’s letter to Putin emerged. The invasion of Crimea was a special operation planned well beforehand rather than a spontaneous response to the situation in Ukraine, as Russian propaganda narratives state. The court testimonies mention Russian preparations long before the flight of Yanukovych. Then-head of the naval coastal defense Ihor Voronchenko said, “Russia prepared since 2010, directly [for the invasion itself] from November 2013.” According to him, at the moment of performing the operation, the Russian forces present in Crimea significantly outnumbered Ukrainian ones. Back in January 2014, intelligence officers told Voronchenko that Russia was preparing an act of military aggression. For example, in Russia’s South Military District four brigades of the rapid reaction forces were re-equipped and received training, noted Voronchenko. Later those brigades blocked Ukrainian military units in Crimea. In late January, he knew that in a Russian unit in Hvardeyske near Simferopol, detachments “not from this base” were deployed there. Later this spetsnaz (special operation force) was used to seize administrative buildings. In late January, the operation started as Russian forces started securing its facilities and moving its troops without Ukrainian approval. Voronchenko also testified that he had information that Russia redeployed a contingent of non-Crimea based detachments from Novorossiysk to Sevastopol and to units in other Crimean cities. Former interim president Oleksandr Turchynov noted that the seizure of Crimea started on 20 February 2014 when “blood was spilled at the Maidan.” Yanukovych still remained in Kyiv then, fleeing as all law enforcement chiefs and government members only overnight into 22 February. Simultaneously, the Russian army was building up at the Ukrainian borders. Former chief of the Ukrainian Security Service (SBU) Valentyn Nalyvaichenko said “The occupation started on 20 February 2014,” noting that the Crimean SBU chiefs switched sides and came under direct control of the FSB. Maryna Kanaliuk, an assistant to the Navy Commander, noticed that back in late January and early February 2014 multiple athletically built men aged under 35 emerged in Sevastopol, they had a “specific accent” and were not familiar with the city. According to her, later such men started blocking her military unit, and the “local self-defense formations” emerged later. Russia hosted the 2014 Winter Olympics from 7 to 23 February 2014 in Krasnodar Krai, the Russian region separated from Crimea by the Kerch Strait.